There’s been a lot of chatter lately around artificial intelligence (A.I.) and blockchain technology. Are those terms a lot of empty hype, or do companies really want tech pros well-versed in those arenas? PointSource’s most recent Digital Transformation Study has some interesting findings on that front. 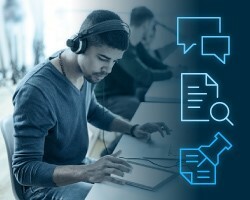 When it asked organizations about their preparation to “effectively use” four technologies – voice-activated, blockchain, A.I., and facial recognition – only 55 percent said they were ready to leverage voice services. Around 46 percent said blockchain was a possibility for them, while 47 percent said A.I. was something they could implement. Only 41 percent are prepared to weave facial recognition into their stack. Among these new technologies, voice seems the most likely to make landfall soon. Some 32 and 33 percent of companies report they are either in the discovery phase or considering vendors (respectively). A full 27 percent have already chosen a vendor for their voice-activated needs. Blockchain is a bit more nascent for mainstream tech companies, and there’s good reason it hasn’t found its way to the forefront yet. Conceptually, the technology can be a bit hard to grasp for those not involved in tech, and PointSource’s data shows CEOs are the ones making most of the direct decisions on investment in new technologies. Blockchain mindshare is tied to cryptocurrencies, and the wild fluctuations in valuation alone are enough to give companies (and CEOs) pause on how to proceed with blockchain. PointSource’s early indicators suggest that companies are actively exploring these technologies—which means that, sooner or later, they’ll need tech pros with the right mix of skills to implement them. For those in the recruiting space, prepare to see A.I., blockchain, and other tech surface in requisitions.